Do these guys publish hindi / urdu phrasings of the question ? I could see massive difference depending on wording. Of course you could get a false positive. Most Indians readily agree with Sanskrit words they don’t know the meanings of. Since most Indians do not understand the concept of religion most polls are not useful. 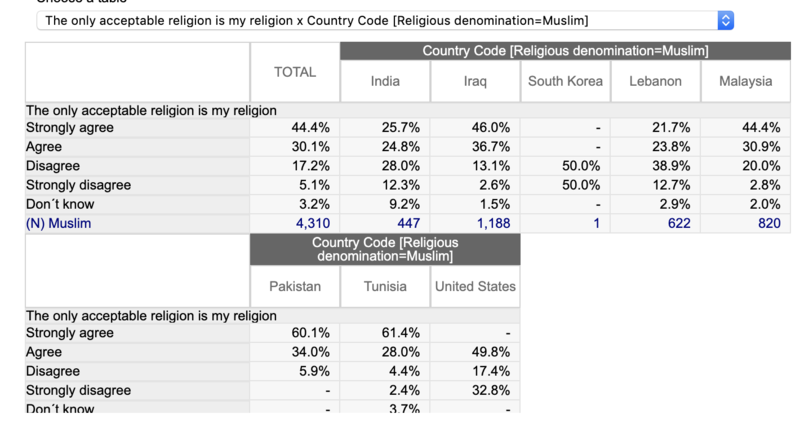 It is possible that many poll respondents were saying that they believe that all religions are true and did not agree with those who say that all religions are not true. Or they completely misunderstood the question. If I were polling I would ask questions about Islam, Sufism, Mohammed pbuh, Gareeb Nawaz. Shirdi Sai Baba, Kabir. I don’t know any other way to ask these sorts of questions. If someone were asked if their Dharma was the only path. Many would say yes. Their word for Islam is mushulman Dharma. Their word for Christianity is Christian Dharma. So implicitly they would be saying that they believe that all Dharmas are true. Christians and muslims are part of their Dharmas. I wonder if the poll used the shabda (word) panth, sampradaya, parampara or dharma. None of these words mean religion. yes. you can find it on the website. the phrasing matters A LOT. that causes some major confusions/errors. I could not find the hindi questions ask on the website. Could you post them to the above blog post? Previous PostPrevious How serious is the Hindu-Muslim conflict in India ?